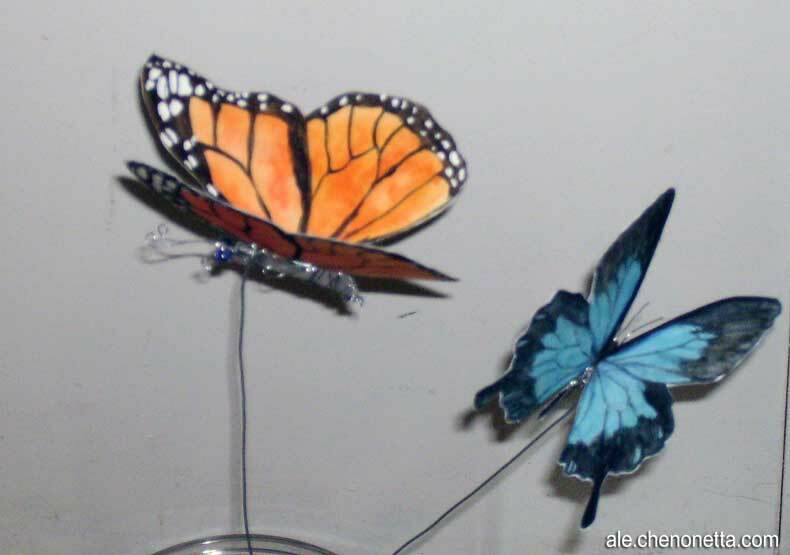 Inspired by butterflies created by Danielle Corsetto of Girls With Slingshots. Something that I’d always thought would be neat to do but didn’t really twig onto how to manage until I saw her versions. The last time I attempted to draw a butterfly accurately was in year 7, and I found it pretty hellish then. This time, it’s been a real breeze, and painting them has been heaps of fun. When I did my research for the Ulysses swallowtail I realised that the tops and bottoms of wings could be quite different and interesting, so now I’m attempting to get the top and bottom sides of the wings relatively accurate. I’m not being pedantic, but it’s nice to have a grounding in reality. These don’t take too long to make so I hope to be doing lots more. 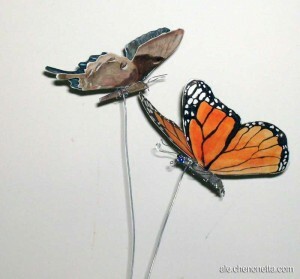 I’ve found lots of pretty butterfly and moth patterns and I’m hoping to do justice to them all. 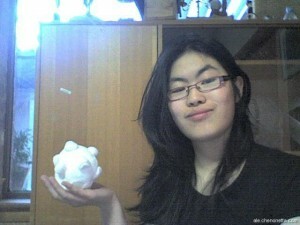 Last December, I started making a plushy version of everyone’s favourite crazy clump – the Katamari. To summarise the Katamari games in a few words, “you roll around a ball, picking up anything and everything in your way”. The Katamari ball is basically a truncated icosahedron (fun fact, “truncated icosahedron” was briefly my nickname in year 5 as I was too nerdy to be a “square”). If you don’t know what a truncated icosahedron is, think of a soccer ball. In the Katamari, the faces that are pentagons become the knobbly nodes. To make my Katamari, I created a truncated icosahedron net based on one from Wikipedia, as my truncated icosahedron would exclude the pentagons. After cutting out the two main sections of fabric, I started sewing furiously! 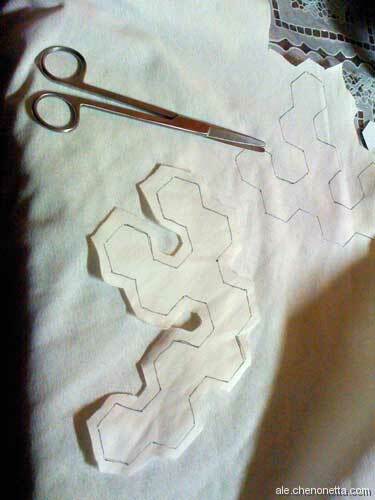 It took most of the day, but I was able to sew together the nets, and add ten of the twelve knobs. After getting that far, I left it. I wanted to add magnets, but had none on hand. The Katamari went to the back of my mind, and I was lazy in finding where to get magnets from. Anyway, last Thursday, I finally ordered some magnets and have put them in the Katamari. The result is quite satisfying! The Katamari can hold the scissors pretty well! 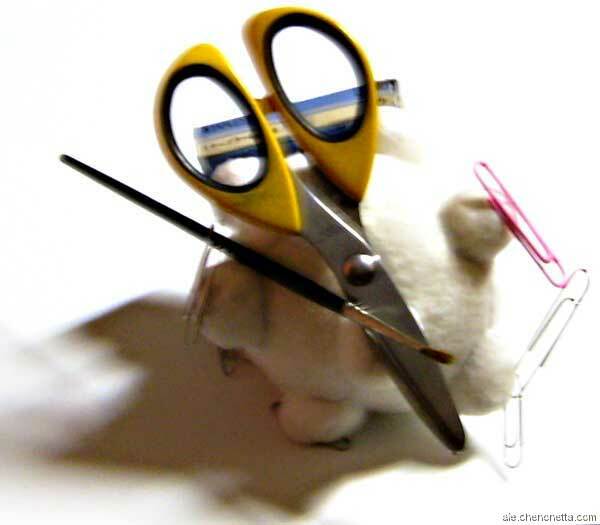 It takes two magnets to hold them quite firmly, but the weight of the scissors can make the Katamari tend to fall over. This might behave a bit better when I add the final two nodes. For objects that it has trouble holding onto with magnetic forces, the nodes are distributed fairly evenly over the surface, so objects can be balanced quite comfortably between them (as is the case with the box of staples in the image above). Objects can also be balanced on ones that are stuck on, like the brush. So there are a few ways to make the Katamari hold objects, and the overall effect is exactly what I was aiming for. The Katamari makes a great pincushion! There is still some troubleshooting left to go. I will have to think about how to colour the Katamari – whether to use a variety of coloured materials, or to use fabric paints. I will likely have to glue the magnets to the insides of the nodes. And I will have to work out how to get the last two nodes onto the Katamari neatly. After I get those things sorted out, I’ll probably make a number of Katamari and maybe even some Team Fortress 2 Sticky Bombs. A few weeks ago, I bought myself a new set of watercolour pans. My old set, a Van Gogh 12-pan set, (really great for travelling with!) has served me well for many years, but it recently dawned on me that with the limited colours provided, there would be hues that I’d never be able to achieve in my paintings. I first tried supplementing my paints with some old tubes, but having worked with pans for so long it felt inconvenient to deal with tubes. So I started researching. I was lead to the Winsor & Newton Cotman range, watercolours designed as affordable alternatives to the high end artists’ colours. I narrowed my choice down to two kits, the Cotman Studio Set, and the Cotman Half-Pan Studio Set. The decision came down to – less colours with larger paint cakes, or more colours? I chose the half-pan set, which includes every colour in the Cotman range. 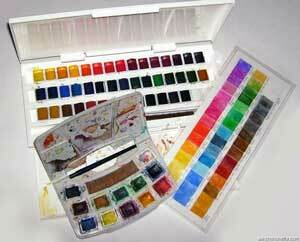 Many watercolour artists will use, and advise use of, a handful of colours for all of their paintings. This is something I was aware of before making my purchase, so why did I go for the larger set? Well, I suppose after using only twelve colours for so long, I felt like spreading out a bit. There are colours in this set that can be mixed fairly closely, but that would rely on me mixing them accurately each time, and often the mix feels less lively than a straight colour. My hopes are to use watercolours in my comics – and being able to reliably produce the same colour on the fly seems like a great advantage to me. Eventually, I figure that I’ll find that I’m using certain colours more than others, and those colours may eventually form my working palette. For now, I’m learning about the new colours I have and the way they behave. I also made myself a colour chart to help me remember what appears where in the set! The new and old watercolour kits, ready for action! Getting these new colours has been a great experience. From learning what was available, to shopping around online to get the best price (I paid less than $60 for the set), to the anticipation and excitement, waiting for it to come to my mailbox… and finally, being able to paint with them! I’ll be posting art soon, I promise! Finally, I’ll just mention this kit contains five repeat colours. In my pre-purchase research I was unable to find out what they were. Now that I have the set, I can inform that the colours are: Alizarin Crimson, Ultramarine, Yellow Ochre, Ivory Black and Chinese White. This semester I have been participating in an art course at the Adelaide Central School of Art. The course is focused on drawing accurately from life. This means lots of careful observation and measuring is involved when depicting subjects – it requires lots of patience! 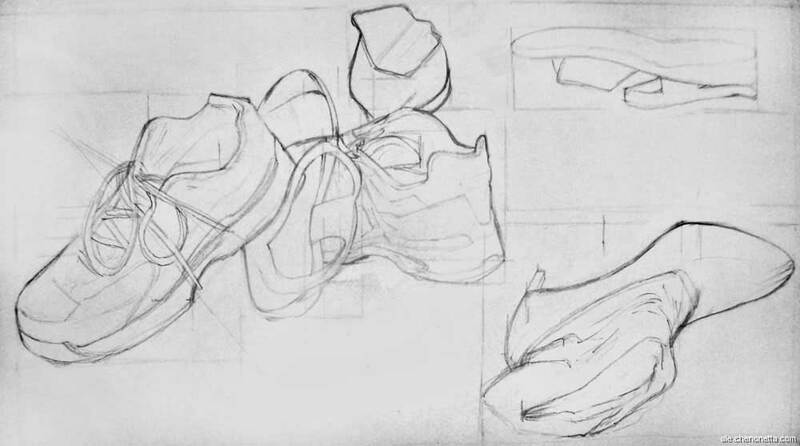 Last week’s lesson was an introduction to drawing organic objects. We were given a pair of ram skulls to draw… with so much information to get onto the page I found it very tricky and didn’t get very far into the picture. The homework went a bit better, even if it did take me around four hours. This week we’ve moved from line drawings to tone. Homework: Draw two matte white objects. Doing something with the web space. Oh what’s this, Ale? You’ve designed two site layouts and have yet to put anything on them? Well here, have a blog. Maybe you’ll update it more often with its convenient content management system. Anyway yeah, my sketch blog. Current aim: minimum one art post per week.